123cargo is the name of the Romanian application BursaTransport with a simplified design for its non-Romanian users. 123cargo and BursaTransport run on a single software platform. The users of the two interfaces interact with the software platform only for their own interest. 123cargo and BursaTransport are properties of Alpega. Between the two interfaces of BursaTransport and Teleroute, property of the same group of companies, there is an exchange of loads. Thereby, some loads published in Teleroute will migrate in 123cargo/BursaTransport, and loads published in 123cargo/BursaTransport will migrate to Teleroute. The imported loads from TLR of those companies double registered in both Teleroute and 123cargo will be asociated primarly in 123cargo with their 123cargo profile and the Teleroute profile will be only mentioned. The safety of 123cargo transactions is endangered by the risk of not being paid for the transport by debtors and by the risk of freight theft with trucks that come at the loading place with false license plates. Related to the risk of not being paid, 123cargo offers an effective system that eliminates the debtors through the declaration of payment incidents. 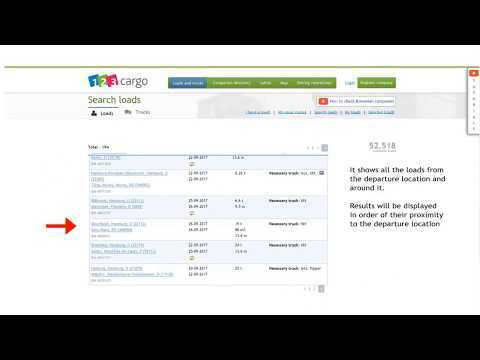 Fraud in 123cargo terms. First and the less harmful one: the attempt or the fact to publish a load at a higher price than the one received from the client. The second, and the most harmful, contacting a freight forwarder under the name of a company, having no relationships with that company, with the purpose to load and steal the cargo. 123cargo Subscription. Is contracted by the Beneficiary and includes access for all the users of a company. No fiscal invoices will be issued until the proforma invoices are cashed. 123cargo contract and invoices. They will be downloaded directly from the website by the client. 123cargo user responsibility. The user has full responsibility for all the information posted in 123cargo and also implies the responsibility of the company that employs the user. Responsibilities of the companies subscribed to 123cargo. It is full and unique for all companies’ locations and users. Responsibilities of 123cargo administration. Under no circumstance will the 123cargo administration be held liable for the postings of 123cargo users. Managing user posts. All posts are published instantaneous without discrimination for all users. Payment delay. Debt that has exceeded the due date with maximum of 60 days. It will become outdated, after the payment has been made, within 6 months. Payment incident. A debt that has exceeded with more than 60 days from the due date. It will become outdated, after the payment has been made, within 3 years. Major payment incident. A bank payment instrument supplied to the creditor and unsettled by the bank. Transport incident reported to 123cargo. It is a documented unprofessional situation produced by one of the parties during the transport operation. Published loads and trucks. They have to be real, not being multiplied. They must belong to the company that publishes the announcements or to the companies’ client, in the case of freight forwarders. The post must be deleted after it achieved its purpose. Transport orders and contracts initiated on 123cargo. The company who published the truck or cargo cannot entrust the release or the confirmation of the contract to a third party. Payment or transport incidents. They have to be documented by the claimer. The administration will publish only the incidents that are clear and unambiguous. Automatic deletion of expired postings. The administration will manually erase posts which do not comply. Maintaining in the members list the companies, who despite the fact that their membership has expired, have registered payment/transport incidents or have their membership withdrawn. Company scoring: calculated automatically, can be used as an evaluation tool. Users can mark a post as expired if it was not deleted by the poster and they found out after contacting them that it is no longer available. Graphic highlighting of companies and its posts in the case of payment/transport incidents accumulation. The right to modify the content of this present document. Depending on the circumstances that may occur and with the purpose of increasing the safety of the transaction, the administration reserves the right to bring modifications that do not affect the current memberships. For connections with companies which are suspended at shareholder level, associates, management or users. Based on general business information leading to an evaluated potential risk against other users. In these cases the administration cannot be obliged to provide the reason for denying the request. For delivering a bank payment instrument to the creditor and unsettled by the bank. For committing or attempting fraud (A.4). For supplying false information at registration, upon request, or in the company profile. Based on general business information leading to an evaluated potential risk against other users. In these cases, the administration cannot be obliged to provide the reason for the withdrawal. For repeated breach of these terms and conditions. Claims of companies with withdrawn membership. With the exception of refusing to grant the subscription after the payment, when 123cargo assumes the responsibility to refund the amount paid in advance, the administration is not obliged to refund amounts corresponding to unused subscription periods.